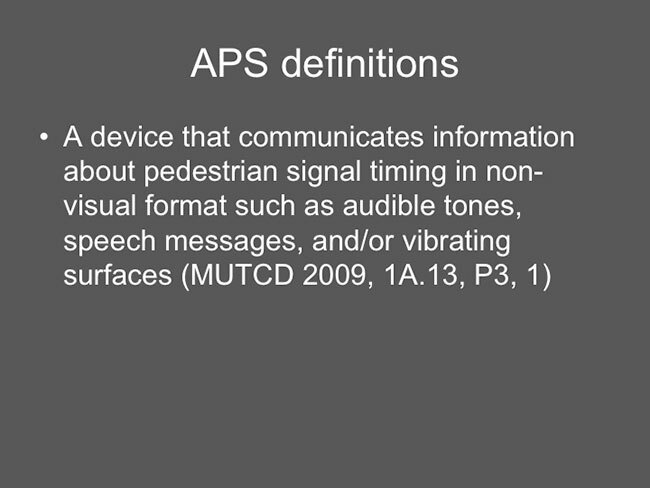 First, we want to review the definition of APS to be sure we all are talking about the same thing when we say Accessible Pedestrian Signal. The Manual on Uniform Traffic Control Devices (MUTCD) will be referred to throughout this course. The MUTCD definition of accessible pedestrian signal is “a device that communicates information about pedestrian signal timing in non-visual format such as audible tones, speech messages, and/or vibrating surfaces”. The language in MUTCD Part 4 now requires both audible and vibrotactile walk indications. Another document we’ll discuss today is the Proposed Accessibility Guidelines for Pedestrian Facilities in the Public Right-of-Way or Proposed PROWAG. The latest version was published by the US Access Board in 2011. These are guidelines on how to meet requirements of the Americans with Disabilities Act.